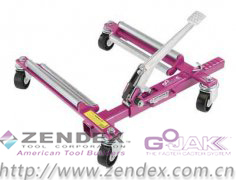 The model 4107 is the perfect tool for self loading smaller wheel assemblies primarily found on light aircraft. The extreme angle of the handle allows for maximum clearance from body parts and fender covers. Hand operation enables you to easily use directly under wings where pedal operation would be more difficult. The Model 4107 can handle wheel weights up to 1025 pounds, tires ranging from 7 1/2 to 22 inches in diameter and widths up to 7 inches wide. 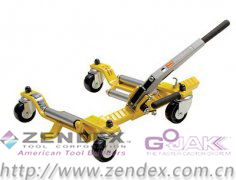 The built in linear ratchet provides smooth and controlled lifting and lowering of tires. 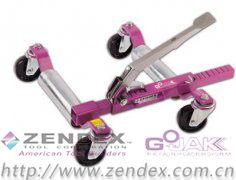 The unit uses four, 3 inch double ball raceway casters and is available in right and left hand configurations.